From large lectures and working with TAs to a lack of one-on-one time with professors, there’s no question first-year classes can seem overwhelming to students. 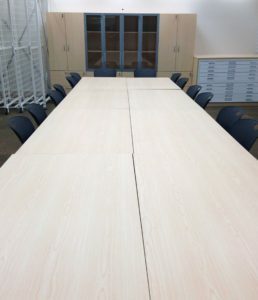 But the Department of Art History & Visual Studies is looking to broaden first-year opportunities with both a new classroom and a new class concept: AHVS 101 — a seminar focusing on art, images and experience — launches this month and will be anchored in the department’s new art collections classroom. Created with release time made possible by UVic’s Division of Learning and Teaching Support and Innovation and her department, AHVS 101 is open to just 20 students from any faculty and is already proving popular: the debut semester filled up fast, and has a healthy waiting list. Conceptually, AHVS 101 not only reflects changes in the K-12 education model but also provided the opportunity to create a new learning environment. Featuring purpose-built display and storage cabinets, pull-out painting racks and hanging wall, a dedicated print cabinet and rolling furniture for a flexible learning environment, the art collections classroom will allow students to engage with the paintings, prints, sculptures, and other objects in UVic’s 19,000-plus Art Collection in an entirely new way. 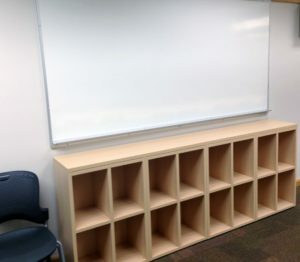 As well as other AHVS courses, the new room will also be used for the department’s new Museum Studies minor, Fine Arts classes, and by Legacy Gallery’s art educator. 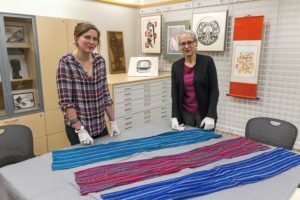 “The classroom will also provide an inviting space for community members to work alongside AHVS faculty members and students with artworks from our collections,” notes Campbell. Until now, art works had to be transferred back and forth between campus and either downtown’s Legacy Gallery or the storage facility at Queenswood, which is risky and expensive; now, work can simply be left in the room, safely stored and ready to be used. “Because we have to be really careful of security and conservation requirements, this creates an opportunity to make better use of the Legacy art collection and to have students engage with artworks much more intimately,” says Wyatt. The art collections classroom is one of two new spaces unique to the department and UVic: also new this year is the Fine Arts interactive media lab, designed to support the growing strength of AHVS’s Visual Studies stream. Wyatt, the 2017 recipient of the Fine Arts Award for Teaching Excellence, feels the new course is a perfect fit both for students and herself. Interested in finding out more? 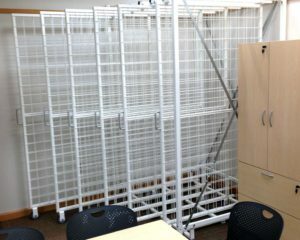 An open house of these new interactive learning spaces will be part of UVic’s Ideafest in March.